Are you experiencing back pain? Are your energy levels low? Do you notice poor blood circulation in your body? If you answered yes to any of these questions, then it might be time to consider reflexology in north Phoenix at Pure Health & Wellness! Reflexology is the application of pressure to areas on the feet, hands and ears. This treatment option is relatively relaxing and is sometimes used as an effective way to relieve stress. Proponents of reflexology believe that areas of the feet, hands and ears correspond to different organs and systems in the body. Applying pressure to these areas affects the organs and overall health of the person. So how does reflexology differ from massage? While many of the benefits are identical, massage is the manipulation of soft tissue, while reflexology revolves around applying pressure to reflex zones to ease tension in the body. But by combining massage with reflexology, patients can experience the best results. Nerve function. Opening and cleaning out neural pathways, like muscles, can improve functionality and flexibility. Energy levels. Reflexology can increase metabolism and energy within the body by aligning various organ and muscle systems. Circulation. This is one of the most well-known benefits. Better circulation throughout the body aids in faster healing and re-growth of damaged cells. Toxin removal. This treatment has been shown to improve bladder function and reduce urinary tract issues. Migraines and headaches. 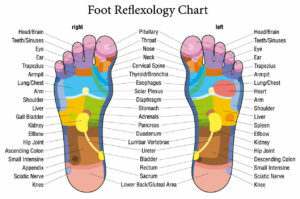 One of the primary reasons people turn to reflexology is, because it eliminates pain. Reflexology reduces the severity of migraines and headaches by relieving tensions in the muscles that typically cause this condition. At Pure Health & Wellness, we offer massage for back pain and treatments that target other problem areas to help you get back on your feet in no time! Our professional staff is well-versed in many techniques, including reflexology, that can help with various afflictions. Schedule an appointment today and experience the benefits of reflexology in north Phoenix!